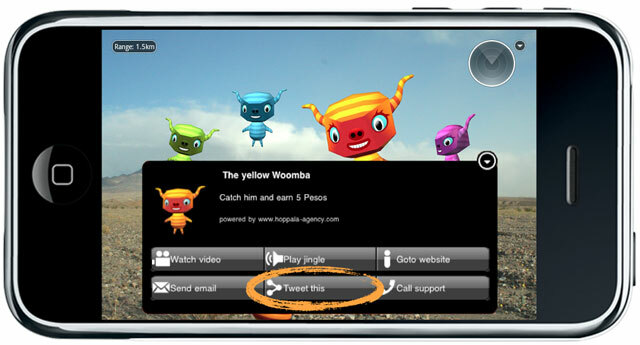 Add Twitter to your Layar augmented reality application with Hoppala Augmentation, the Layar content management system with built-in Twitter support. Customizable geocoded status updates allow for instant sharing of nearby augmented content. It’s never been so easy to connect your mobile ar experience with Twitter. Hoppala Augmentation provides an easy way for non-technical creatives to start experimenting with augmented reality and Layar. It seamlessly connects your mobile AR experience with Twitter with just a couple mouseclicks. All in an easy to use grafical web interface. Hoppala Augmentation allows you to focus on what’s most important: your content. But we learned from our customers that adding interactivity is getting more and more important as well. So we worked on a new and even broader support of interactivity built into Hoppala Augmentation. Every augment supports video and audio content, it can refer to a website, send an email or sms or initiate a phone call. 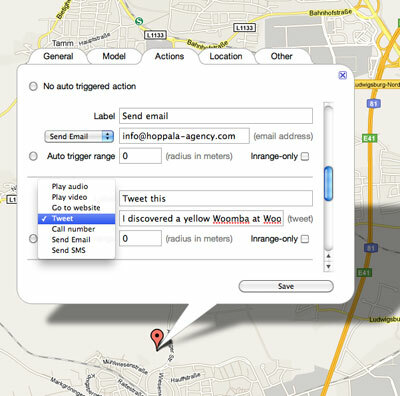 Hoppala Augmentation supports up to eight customizable actions attached to each augment. And today we added “Tweet this”. “Tweet this” seamlessly adds a tweet button to your augment. Of course Hoppala Augmentation lets you customize the button label and respective status update. Your users are experiencing the most convenient way to connect with Twitter via secure revocable OAuth authorization. Built-in confirmation messages make sure your users always know what’s going on. And location information is included with every tweet by default, however there’s opt-out available with every tweet as well. Hoppala Augmentation takes care of the complete authorization and status update process. As a developer you just enter the tweet button label and a status update and you’re done. Hoppala Augmentation is your perfect Layar companion. It offers a fullservice solution for producing augmented reality applications and it easily integrates with Layar. Create and maintain your content at Hoppala Augmentation and publish cross-platform at Layar for iPhone and Android smartphones. Try Hoppala Augmentation for free and learn more about Hoppala Augmentation in our video tutorial. This entry was posted in Augmentation. Bookmark the permalink.